This afternoon, hundreds of military police, central security forces and regular police forcefully reopened Tahrir Square, the birthplace of the Egyptian revolution. Since 8 July, 22 days ago, thousands of protesters, including some of the families of those killed during the January 25 Revolution, have occupied the square. These protesters and the dozens of revolutionary youths groups and political parties that supported them, aimed to pressure the ruling military council on a number of political demands, including a speedy trial for Mubarak and the police officers accused of killing at least 1,000 people and injuring 10,000 others during the uprising. In the last two weeks, the government of Prime Minister Essam Sharaf made a number of concessions to the families of the martyrs and the protesters, which included replacing most ministers in his four-month-old cabinet, forcing hundreds of high-ranking police officers into retirement, and placing some accused officers on desk duty pending their trials. In the last two days, and as the Muslim holy month of Ramadan approached, a number of political groups and coalitions which were taking part in the sit-in withdrew from the square in order to give Sharaf a chance to implement his promised reforms. As of this morning, only several hundred protesters, and perhaps less, remained in the square. However, most of those who decided to continue the occupation did announce that they intended to call it off on Wednesday if the military council honoured its promise to begin trial procedures for former president Mubarak, as it had promised the country over two months ago. Nevertheless, at around 2.30 this afternoon, the ruling military council sent troops into Tahrir to end a sit-in that has caused it plenty of headaches over the past few weeks. The military council attacked Tahrir square from all directions without prior warning. Dozens of tanks belonging to the central security forces, army tanks and small personnel carriers stormed into the square from all directions. Soldiers rushed camping protesters and destroyed every single one of the dozens of tents used as shelter in the past three weeks. Police and army soldiers arrested dozens of protesters and led them into military tanks that eventually sped out of the square, presumably headed towards military processing stations. For about an hour, military police and regular police chased after handfuls of protesters in the alleys and side streets that surround Tahrir. Angry groups of vigilantes worked with the army to help it identify suspected “revolutionaries”, and arrested a number of them. High-ranking police officers searched the fast food chain Hardees on the south side of the square and other stores that remained open for rebels who might be hiding out. By 4pm, as it became clear that the army was in control of the square, cars and buses were moving in and out of the area for the first time in weeks. Dozens of storeowners, Salafis, and others who opposed the sit-in had gathered in the square to thank army and police generals for ending the sit-in. However, the standoff between the two sides lasted only six or seven minutes. Well-rested military police soldiers marched on the protesters and physically pushed them out of the square. During those tense two hours, this reporter witnessed plainclothes and undercover cops bashing some of those they arrested on the head before pushing them into military tanks that drove them away from the square. A few dozen young people tried to plead with army generals to halt the brutal treatment of those arrested but to no avail. 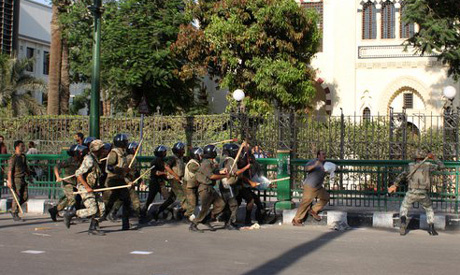 Through the attack operation, dozens of plainclothes police personnel, who resembled those that Mubarak used for decades to break unrest, roamed the square. They wore army and police vests, checked identification cards randomly and confiscated a number of cameras from bystanders and reporters. As of 7pm, civil liberties lawyers were rushing towards Abadeen Palace near downtown Cairo where they believe the army was preparing to process those it arrested in the square. According to most independent observers in the square, the army had detained at least 26 people and four others were considered missing. On its Facebook page, the Revolution Youth Coalition, one of the main revolutionary political groups in Egypt, unequivocally, “condemned the army and police attack on peaceful protesters in the square on the first day of the holy month of Ramadan”. “We believe that the protesters have the right to peacefully sit-in in the square,” the statement read. Other activists have started mobilising to pressure the army to release those individuals it detained this afternoon. Today’s army raid on Tahrir Square is the third time the military council has ordered attacks on protesters who decided to use the square to make a political point that the generals did not approve of. The first two attacks took place consecutively on March 9 and April 9 of this year. Same as the old Boss!!! !